Face painting is a great traditional way to keep children happy at absolutely any event. 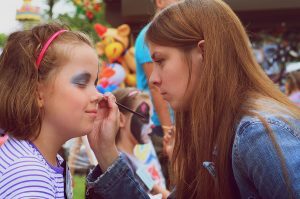 Whether you have a school fair to plan, a community or village fete, or in fact any kind of function or party, you may wish to hire Bizzy Bouncers to provide you with expert face painters. You can guarantee that all the children will be queuing up to become a beautiful butterfly, a fairy princess or one of their favourite characters by having their face painted. What little girl doesn’t like glitter or pretty colours all over their face? What little boys wouldn’t want to be spider man, batman or maybe an animal? Hiring our lovely, friendly staff to make the children happy at a birthday party or a fete is just what you need. They will only use top quality face paints and are always very hygienic when it comes to using their products. We can leave your children feeling great by becoming a tiger, a butterfly, a monster, or even a lizard, the choices really are endless of what they can be. We’ll give your guests images of what we can do and they will be able to choose from so many that they will be spoilt for choice. All our face paints are non-toxic and are in compliance with British Standards and can easily be washed away when parents are ready to clean their little ones faces!